Julep Trina is from my November Bombshell Box. It is described on Julep's site as a deep aubergine shimmer. I've heard the term "aubergine" before, but I wasn't quite sure what it meant....so naturally, I Googled it:) Aubergine is an eggplant color. 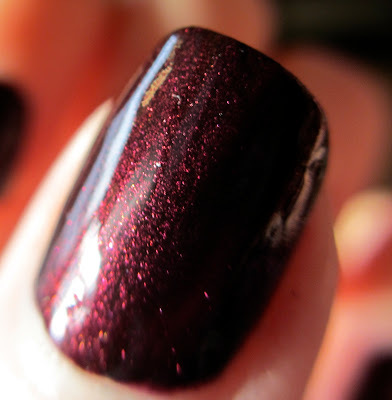 The site I went to showed an eggplant and yep, that's exactly the color of this polish. This is two coats and the formula was very nice. I typically like Julep's formula. I like that it has a bit of a pinky purple tinge. It looks like a deep burgundy wine. As always, if you haven't tried Julep, feel free to try it out for a penny and click my referral link below. If you have more questions, feel free to email me or ask in the comments below. This is one of the prettiest Juleps I have seen. Aubergine is fun to say, thank you for using that word! It is fun to learn to like whole new classes of polish, congrats on going over to the dark side to play. I am edging a bit more toward those colors myself lately! They make my dark skin look paler in contrast, which is fun for a different look. Yes, Aubergine sounds better than Eggplant :) I think I'll try some more vampy shades soon! Also, I had to google aubergine too, haha! Oooo this is a beauty! I love the richness of it! I like this color on you. I don't think I would gravitate to it on my own though. You are always cool :) This is soooo gorgeous, such depth! And YAY YOU for doing a vampy shade! You wear it gorgeously and elegantly. Me too! Nothing wrong with it either. Yes, it's really cool. Thanks for stopping by. Isn't this a beautiful shade?! I got it too, but haven't worn it yet. I'm so glad I chose this box! !